Based on the situation analysis, cashmere supply chain stakeholder consultations, government policies on agricultural and natural resources sector, national and international academics and practitioners research findings, SFA has identified priority areas for its work programme and developed its Strategy 2017-2020. The priority areas of work programmes are to support responsible animal husbandry of livestock; promotion of sustainable natural resource management; and development of cashmere value chain: improvement of cashmere quality, standards and marketing. The current Codes of Practice for Grassland Management and Animal Welfare are to be embedded into a registration and accreditation process for herder community programme. The establishment of this is our ‘core activity’ during the period 2017 -2022. The SFA is planning to implement its work programmes systematically following robust and transparent mechanisms. This is our ‘core activity’ during the period 2017 -2022. The SFA is planning to implement its work programmes systematically following robust and transparent mechanisms. Improve the livelihoods of herders and their families in cashmere producing regions by scaling up our grassroots projects. Supporting herders through innovative staged solutions. Reduce the environmental impact of cashmere production and promote the protection and conservation of biodiversity through our Rangeland Stewardship Code of Practice. Assure the welfare of cashmere goats through our Animal Welfare Code of Practice. Improve health and welfare management of goats and implement adaptation measures to extreme weather conditions. Promote global awareness of sustainably produced cashmere. 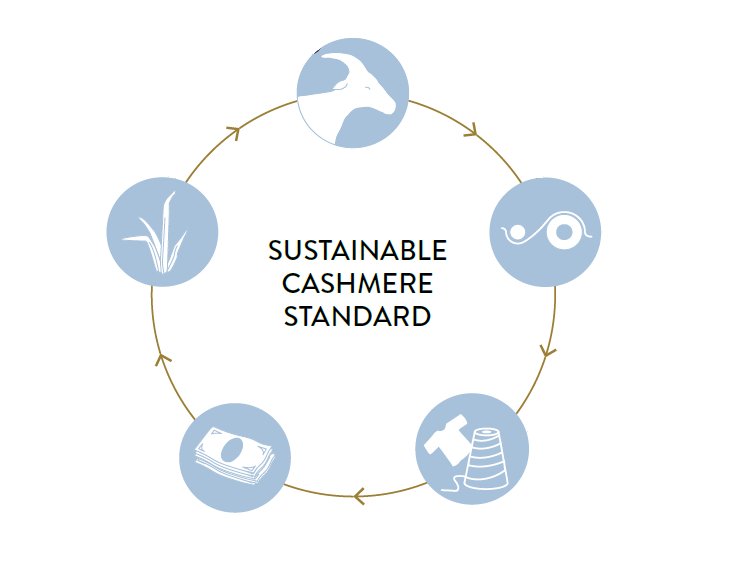 Increase the supply chain’s commitment to producing sustainable cashmere. SFA’s Codes of Practice and capacity building approach are based on robust research and development. These are supported by leading research experts from social, economic, environmental, educational and anthropological scientific fields of study and work. The SFA Standard System is developed together with key industry stakeholders through broad consultation and by engaging herder cooperatives, biodiversity and conservation experts and wider supply chain. The overall objective is that internationally traded cashmere is produced, processed and marketed using sustainable practices. The SFA has developed Codes of Practice in Grassland Stewardship and Animal Welfare. These feed into the SFA Cashmere Standard System which serves as a recognised industry benchmark for sustainable cashmere production. As part of championing grassland management, the SFA carried out "Young Herder Training Programme 2015-2017. We see young herders as a catalyst in championing change in grassland management, animal health and welfare and vital support intervention for implementing our Code of Practices. The SFA is working to create formal conditions where young herders gain access to diverse types of knowledge to improve their adaptive capacity and build their resilience in changing social-ecological pastoral systems. The SFA takes an approach that is a learner-driven regional action approach as opposed to prepackaged general evidences and conclusions. The SFA Young herder training was delivered by the NUTAG ACADEMY and supported by LIFETIME EDUCATION CENTRE OF GOBI-ALTAI AIMAG, REGIONAL BUSINESS LEADERS FUND, LOCAL COUNCILS OF JARGALAN AND BAYAN-UUL SOUMS OF GOBI-ALTAI AILMAG. The SFA is providing Training of Trainer (ToT) and engagement activities throughout its herding communities and sfaff of partnering NGO's . If a producer organisation works with a supporting NGO partner, and the staff of the NGO partner have been adequately trained by SFA, subsequent external assessments may be conducted by the staff of that NGO. The purpose of this measure is to reduce costs of certification.The SFA training manuals to support its capacity building of herders in the Codes of Practice and covers guidance on implementation; building resilience and adaptive management and disaster risk management. a. A Fibre Quality Improvement– it is recognised that the development of improved fibre is to form part of the incentive for the supply chain actors and help to provide long-term financial incentives for herders. SFA donors and supporters are invited to invest in specific breeding programmes in partner communities. b. A Disaster Risk Fund - directly supporting herders in preparing for severe weather events and other disaster prevention measures. Donors and supporters are invited to contribute to this fund once it’s established.